Great conversations begin before you speak. The tools on this page will equip you to prepare, adapt, and converse effectively.Each tool is field proven and can either be printed or completed on-line and then printed. All the tools are ©Sales Pro Insider, Inc. and are to be used for individual use. If you’d like to incorporate the tools into your team’s habits, contact Nancy. If you are looking for more comprehensive tools for your team, Nancy Nardin of Smart Selling Tools updates her reviews and tips on sales tools constantly. You can find the site here. 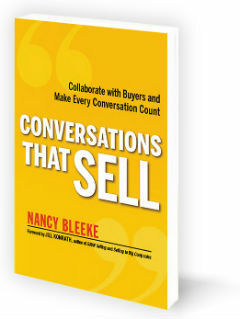 You can get a free 2013 Guide to Sales Tools here as well.